Kotwara By Meera & Muzaffar Ali has been around for awhile now, but for me its the first time I heard or saw what the brand was all about. This times LFW Summer/Resort 2017 collection had quite a few stunning designer collections, and the one that stood out for me the most was Kotwara. I had to do a bit of research to understand who Kotwara were, there was so much of misinformation out there. Some said Kotwara is the designer…well its not. From what I read, and I am impressed. Muzaffar Ali happens to be the present Raja of Kotwara. 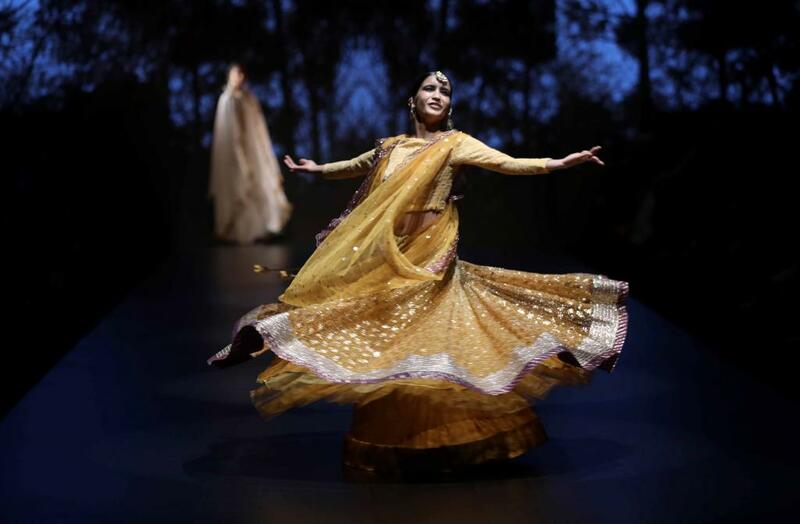 He belongs to the Muslim Rajput royal house of Kotwara in India, and is the designer behind the collection Kotwara. Kotwara was founded with the idea to revive the traditional craft of Awadh (Uttar Pradesh, India) in 1990. Kotwara, an international couture brand, crafted by the duo Muzaffar Ali & Meera Ali in 1990 to revive the traditional craft of the region of Awadh, India. Over the last two decades, Kotwara has been a symbol of style and elegance reinventing embroidery, weaving and creating silhouettes which have timeless quality. Zardozi and Chikankari has been the forte of Kotwara with some of the finest craftspeople working for generations blending cultures and styles from different parts of the country.​ – Indianroots. Its not extraordinary, but the simplicity of the outfits is what attracted me to the creations. Its looks so pure, subtle in its beauty. I loved the soft color schemes in the outfits and I wish these were affordable, but well, they are NOT ! I love the story behind the outfits, its all about showcasing the talent of these artisans who if not for people like Meera & Muzaffar Ali, we just wouldn’t know about. I remember the last time a similar story cropped up was during the Manish Malhotra show (Mijwan) way back in 2014. Kotwara is 160 kms. from Lucknow, bordering Nepal from Dudhwa National Park, set amidst an undulating landscape of ancient mounds overlooking an oxbow lake. A road through a 500 acre forest leads to the Anhalwara Palace which is one among many of the designer Raja’s homes. To set the mood of the collection, the very graceful Shivani Varma danced elegantly on the ramp. Opening the show with the white section of chikan work of a very high order, there were kurtas, shararas, anarkalis, angarkhas and dupattas that were at times turned into capes with ruffles. The show started on a pastel shade card of white, pale blue, pink, peach and green, the colours then moved to stronger hues like fuchsia and black, all encrusted with beautiful embellishments in sensational designs.